The walls in the living room are painted a matte, smoky chocolate brown. (Wall color: Mahogany No. 36; .) “It’s almost like eggplant,” says Michelle. It adds richness to the space, which has lofty ceilings and exposed beams. The floors are polished red oak. To break up the brown, the couple painted the fireplace surround a warm white. 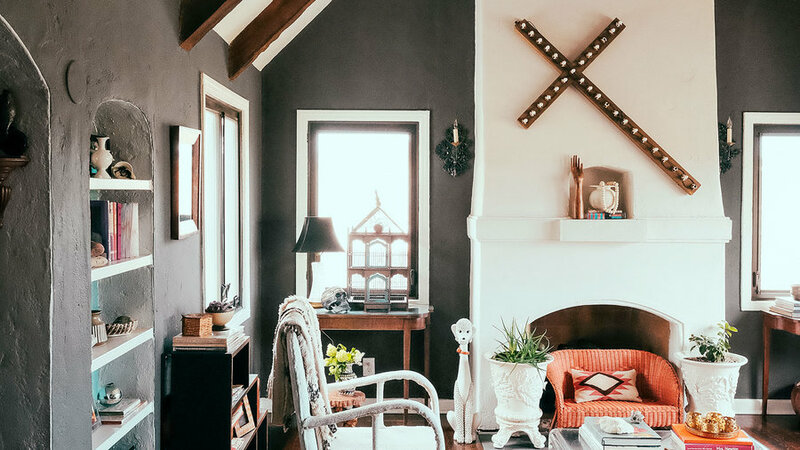 The room’s conversation piece is one of Michelle’s favorite flea-market finds: a light-up cross she hung diagonally over the fireplace. Michelle and her husband, Tracy, wanted the yard to feel like an outdoor living room for them and Savannah (on the chair) and Saffron. 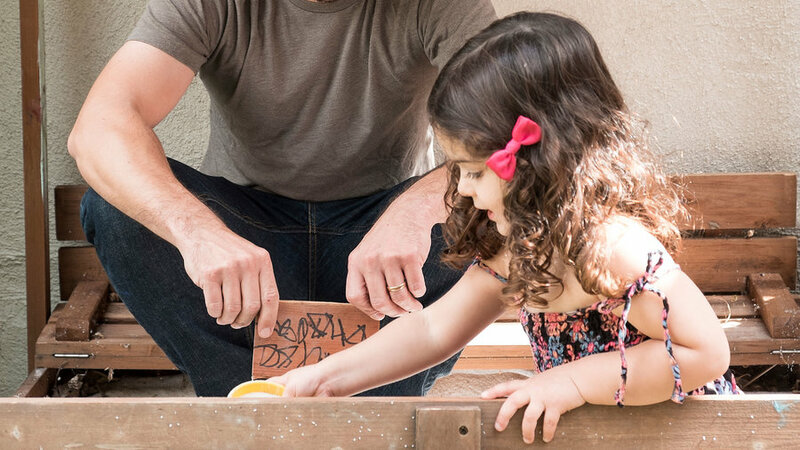 A neighbor taught them how to make inexpensive living walls out of pallets. “It’s such a lovely addition to the garden,” Michelle says. The dark bookcase shines a spotlight on its contents as a whole, adding a focal point to the room. The family doesn’t usually entertain formally, so they put the antique dining table in the great room. 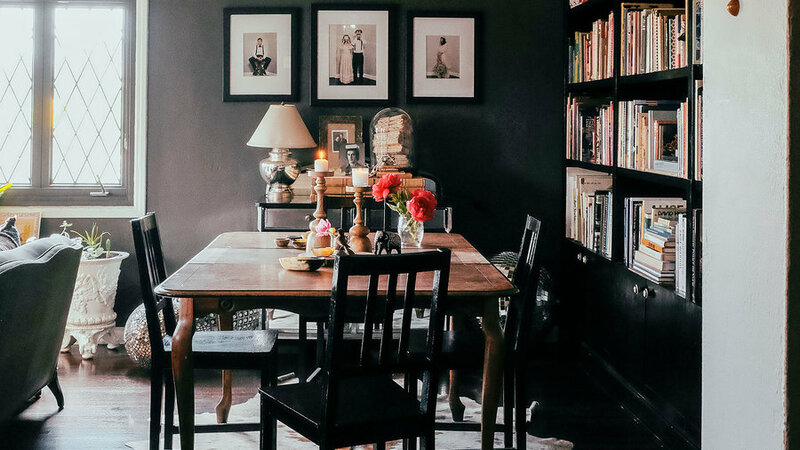 “We loved that it was old but not too ornate,” says Michelle, who paired it with clean-lined Ikea chairs that she painted black to match the built-in bookshelves, which cover the entire wall behind the table. 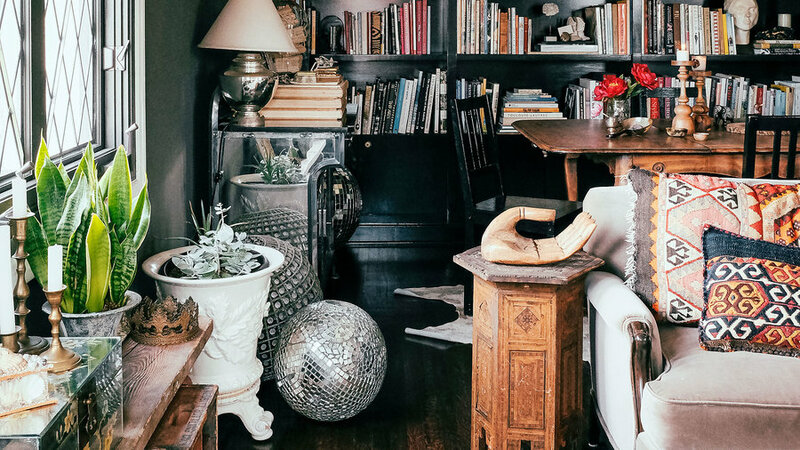 For lighting, she hung a few favorites from her collection of disco balls rather than a traditional chandelier. 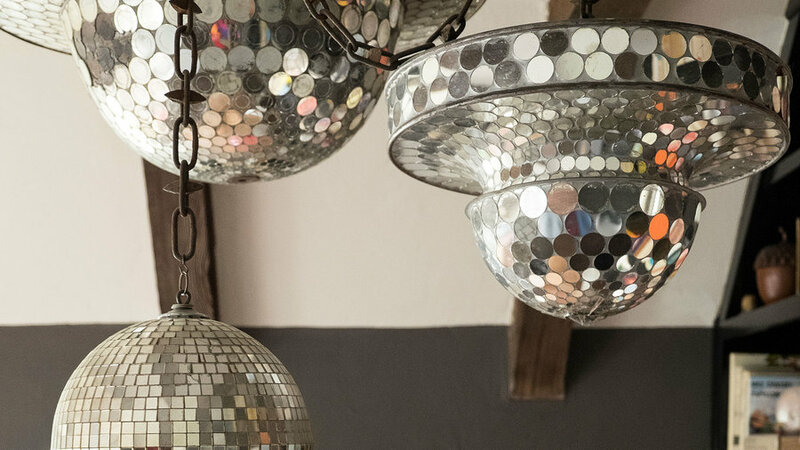 Michelle’s favorite collection, her disco balls, comes with a story. “Years ago, I was living in Philadelphia and saw this amazing disco ball and fell in love with it, but I couldn’t afford it at the time. A friend visiting from New York bought it and promised me, jokingly, that she’d leave it to me in her will. I never forgot that special disco ball, nor did I want her to die, so I started my own hunt. I have a collection of seven now, and I’m always looking to add to it,” she says. Michelle and Tracy’s bedroom holds her favorite sea-inspired objects. She wanted the room to feel serene, so she chose varying shades of aquamarine. Tracy mounted a painting on a map Michelle found at the Pasadena City College flea market, using it as a dramatic backdrop. Wall color: Sweet Pea; . 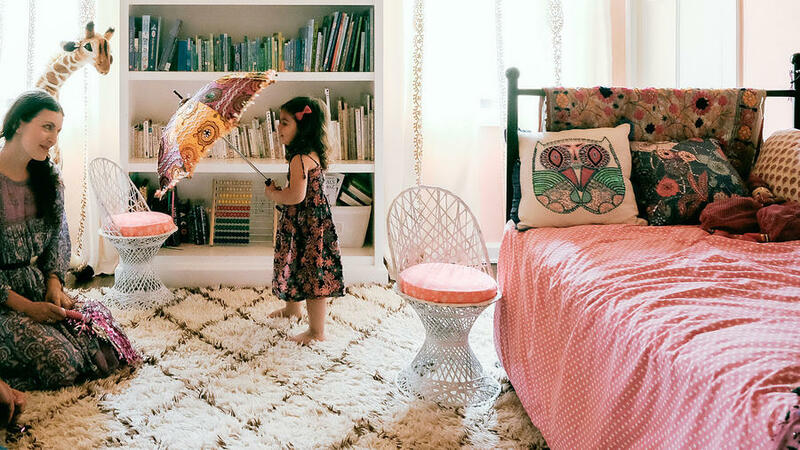 Savannah and Saffron’s room was inspired by a photo of a palace in Jaipur, India, that Michelle couldn’t get out of her head. 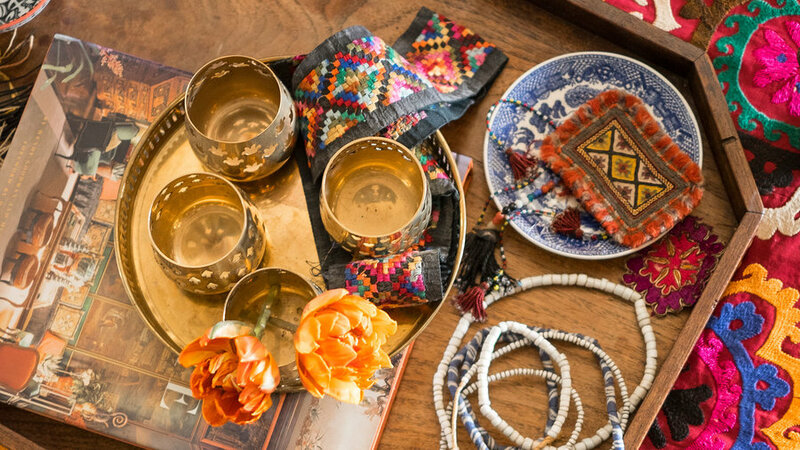 “It’s such a quirky pairing, the dusty gold with the Indian pink, but it works with all the textiles,” she says. Michelle created a pattern on the shelves by organizing the books according to binding color. 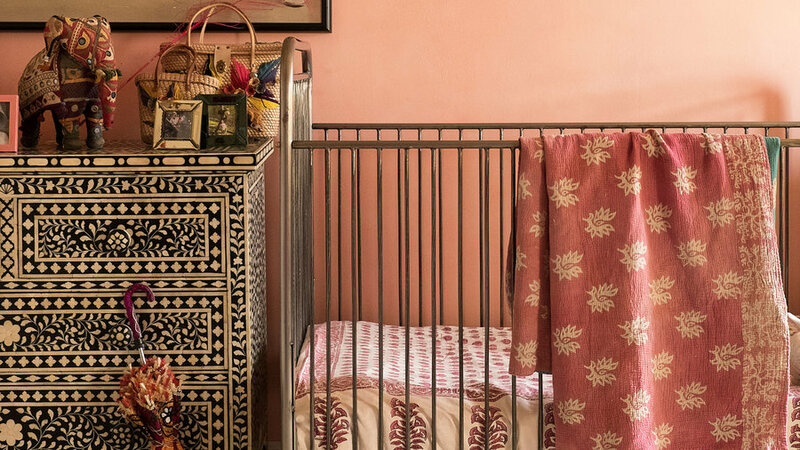 In the girls' bedroom, Michelle used Moroccan-inspired curtains found at Anthropologie. 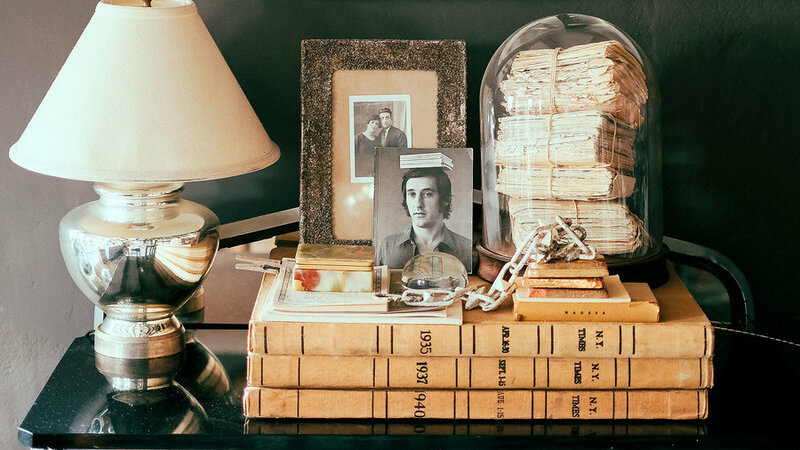 “I wanted something emotional but not too crazy because of the colors of the books and the walls,” she says. 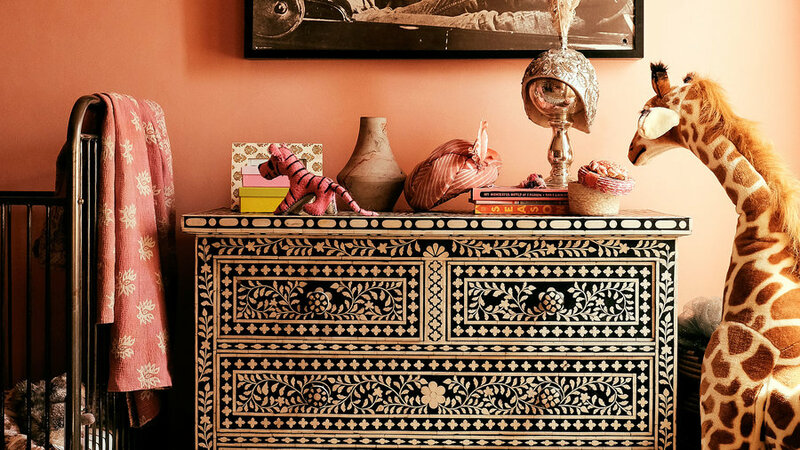 The black-and-white artwork pairs perfectly with the ornate, inlay Indian dressers. Michelle made the mobile using traditional Indian garlands. 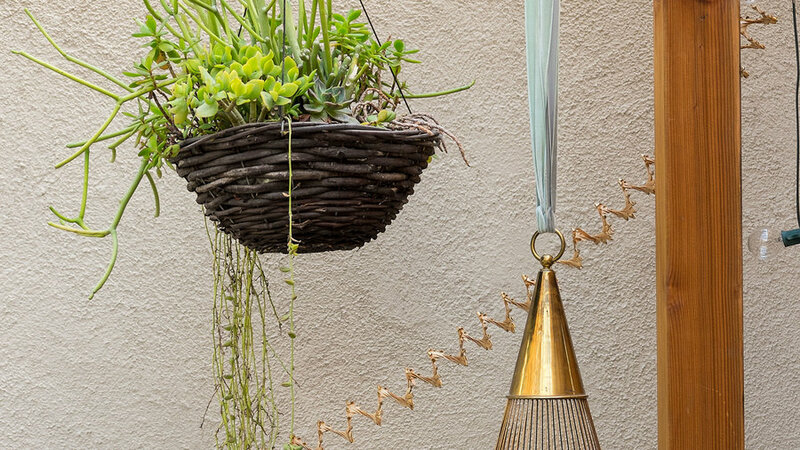 “I took the top of a lampshade hoop and wrapped it, then draped these beautiful garlands from it,” says Michelle. 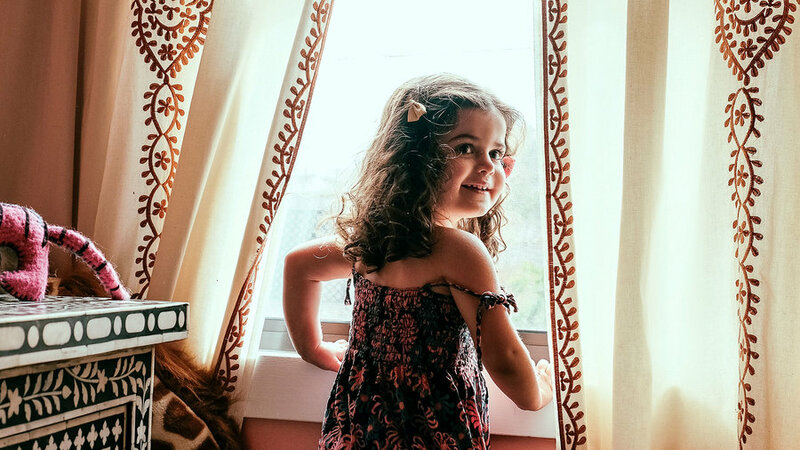 Her mom found the molding, which she added to the room for decorative detail. “It was such an inexpensive way to add visual appeal,” she says. Michelle cut the sweetness of the palette by adding black-and-white cowboy artwork that contrasts with all the patterns and prints. The photo is a still from the movie Giant, starring James Dean. “I bought it after I fell in love with a similar painting,” says Michelle. 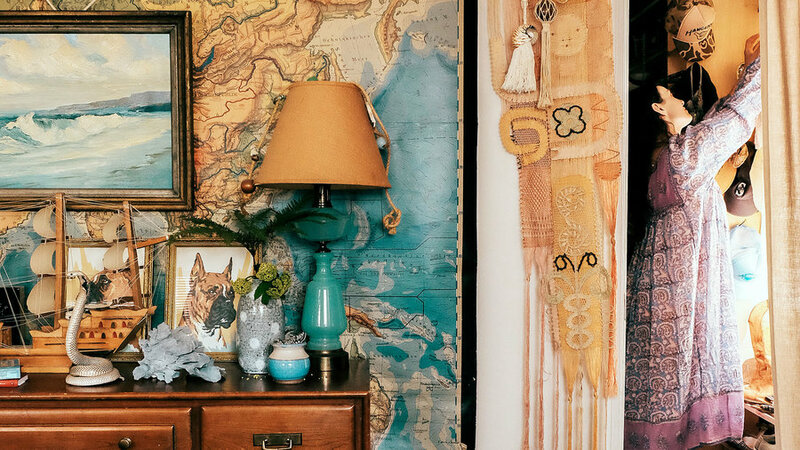 “I couldn’t afford the painting at the time, so I bought the poster instead, and then I was surprised with the painting as a gift just a little while later.” The black-and-white artwork pairs perfectly with the inlaid Indian dresser. “I love dirty aqua blue,” says Michelle. 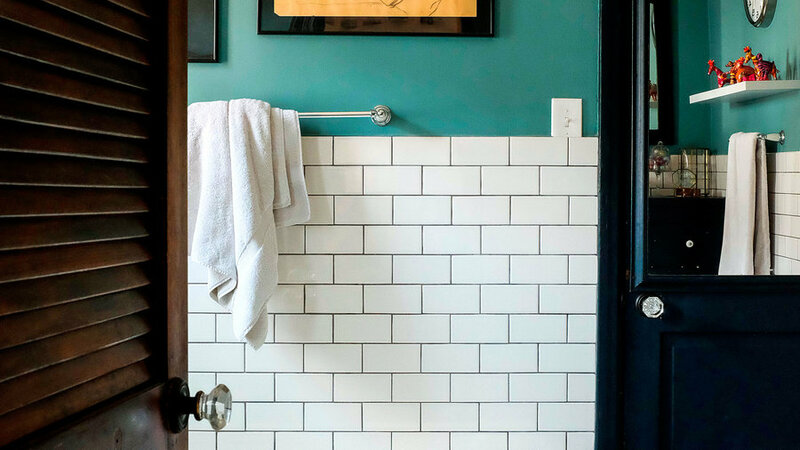 “Too clean and it feels like a beach house in a catalog.” The couple remodeled the dated master bathroom with classic materials like subway tile and black doors and moldings. Wall color: Studio Grey; . The couple replaced the small, impractical cupboards in the original kitchen with roomier units Tracy designed to create a more space-efficient layout. 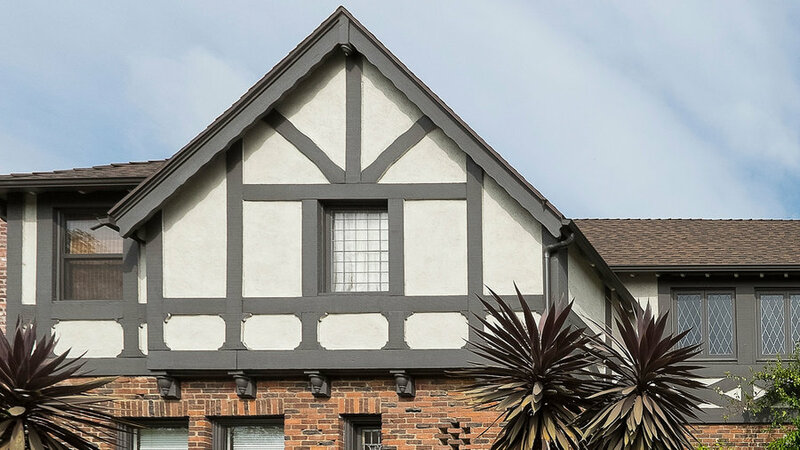 During the update, they had the white enamel Wedgewood stove taken out and restored. 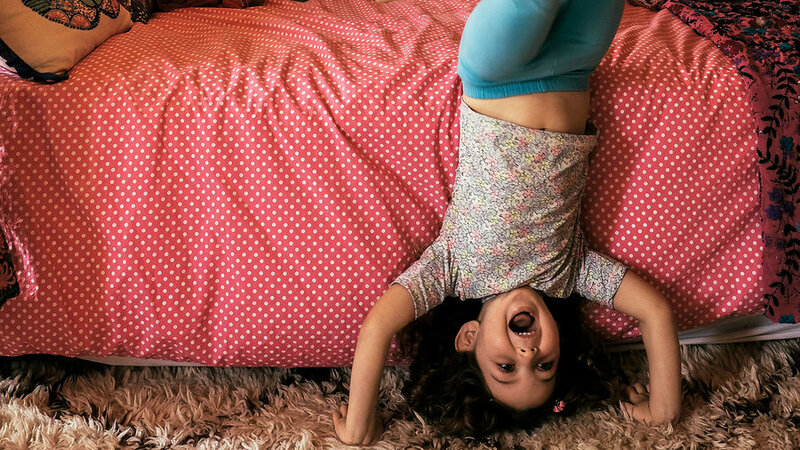 “It was too cute to replace, and I love the way it works, too,” says Michelle. The nook off the kitchen is where the family eats most meals together. 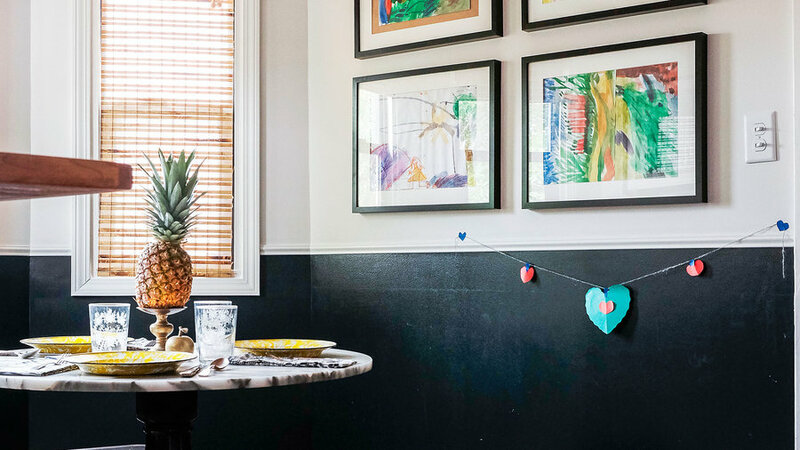 “We kept the walls simple, painting the bottom half with chalkboard paint and leaving the rest white,” says Michelle. The room’s color comes almost exclusively from the girls’ framed artwork. 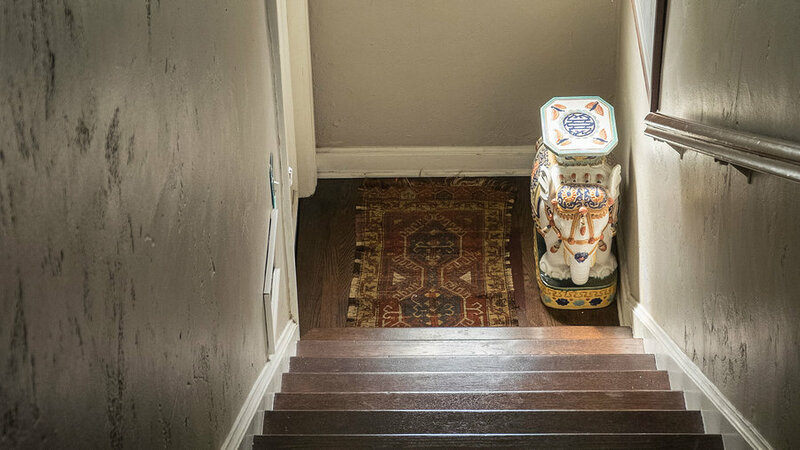 Michelle balances rooms by making sure that complicated vignettes live alongside areas that are more minimalist. 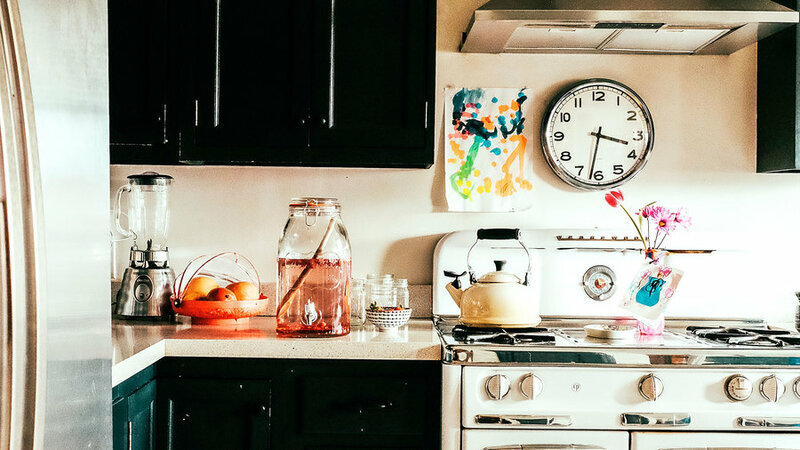 This helps the house feel organized and thoughtful rather than cluttered. 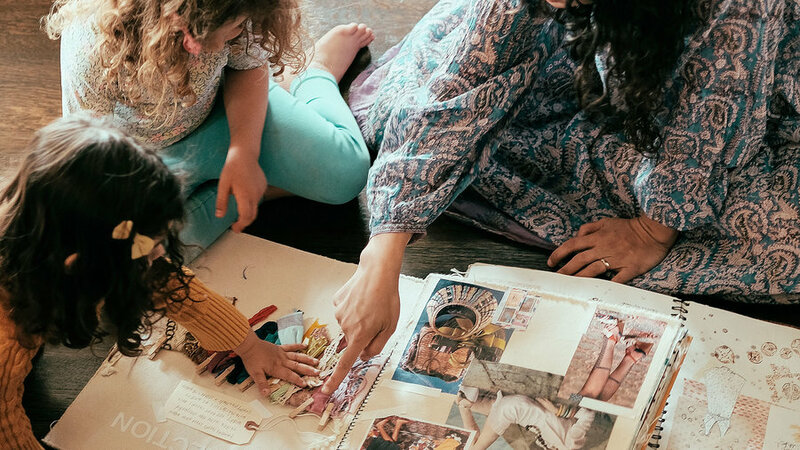 “My work is the biggest influence in my style,” Michelle says. “As a concept designer and art director, hunting for inspiration is the key to my job—my number one personal passion. I scour flea markets, runways, retail shops, museums, and bookstores. You never know what might trigger an idea." “With the Internet and all the exposure people have to each others’ homes these days, it’s a fun challenge to create your own style,” Michelle says. 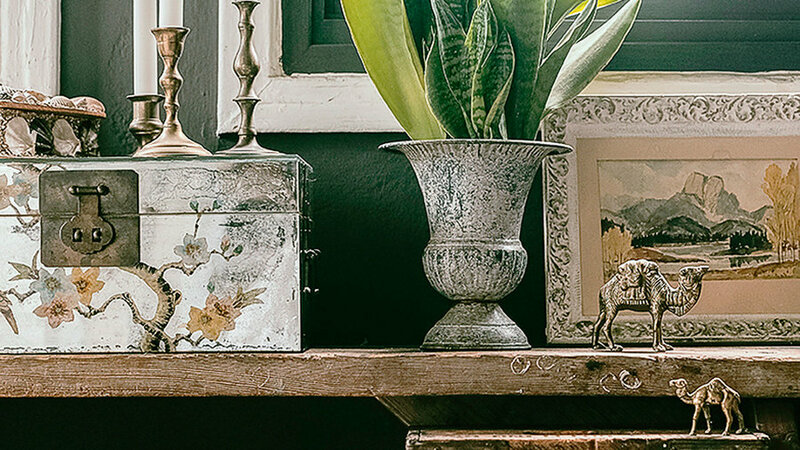 That’s one of the reasons she shops flea markets—she’s guaranteed to come home with one-of-a-kind items. 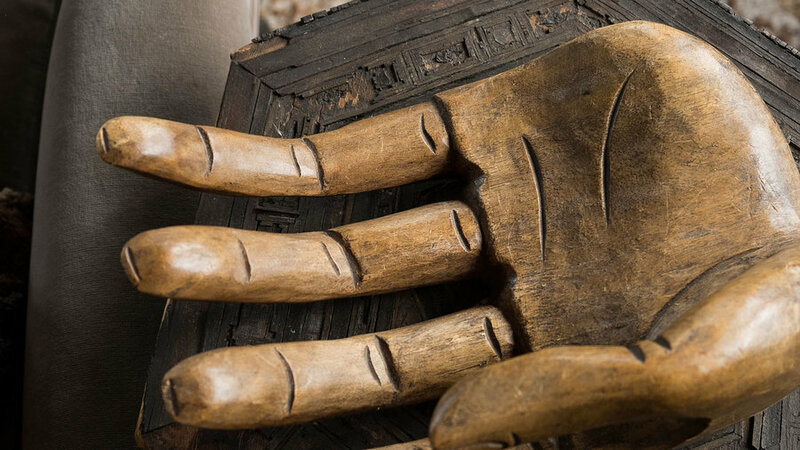 Starting a collection is as simple as gathering a few examples of something you like. “I love grouping things in a theme. 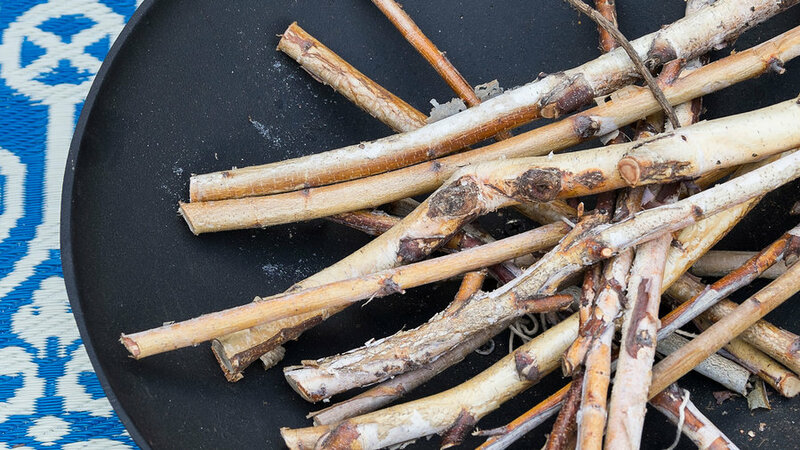 I think it’s so charming to have multiples of something unique,” says Michelle, who turns almost anything—even these humble twigs—into a decorative display. 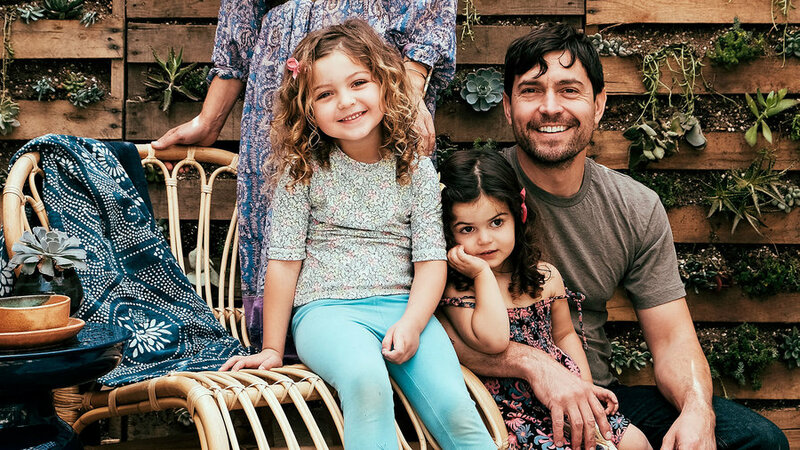 The neighbor who taught the couple how to make the living walls “even taught me how to pinch succulents from our own succulent garden, and trade with neighbors, to plant the wall. It’s such a lovely addition to the garden,” Michelle says. 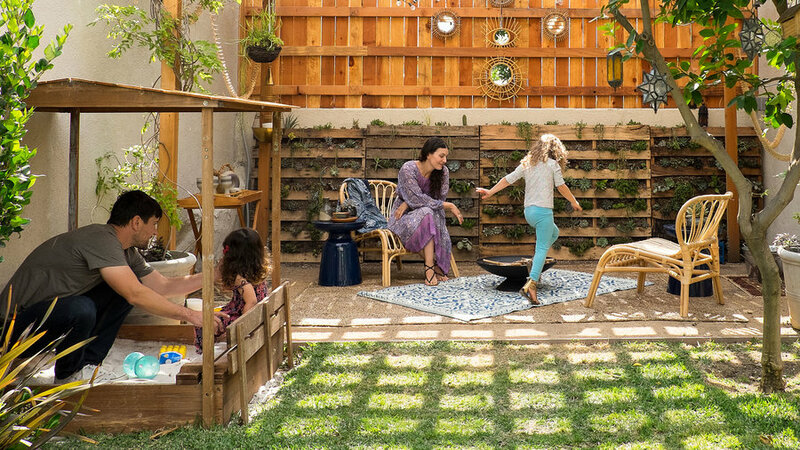 The couple wanted the yard to feel like an outdoor living room for their family, so Tracy built a pergola for the exterior lounge area, as well as a shade cover for the girls’ sandbox. Наш нужный сайт , он описывает в статьях про https://rs-clinic.com.ua.